"We are convinced that Iran can be a key factor for stability and opportunity in the region." 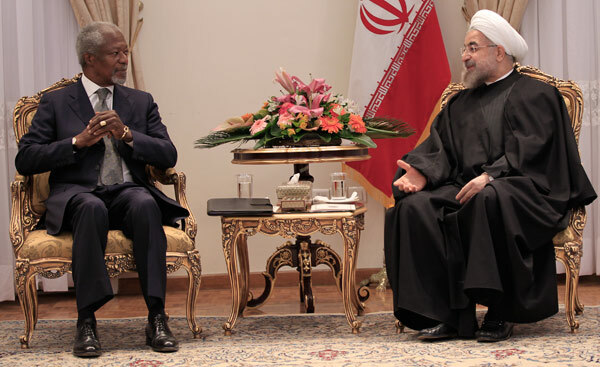 Kofi Annan After a series of meetings with the country’s leadership, The Elders are encouraged by Iran’s new spirit of openness and dialogue with the outside world and look forward to further engagement in the region. TEHRAN – Concluding a full three-day visit to Tehran, The Elders offered their support to the people of Iran during this period of renewed openness and dialogue. While visiting Tehran, The Elders met with various leaders including President Hassan Rouhani; former President Akbar Hashemi Rafsanjani; Speaker of the Majlis, Ali Larijani; Foreign Minister Javad Zarif; Secretary of the Supreme National Security Council General Ali Shamkhani; Head of the Centre for Strategic Research, Ali Akbar Velayati; and Seyyed Ali Khomeini, grandson of the late Ayatollah Rouhollah Khomeini. They also met members of the diplomatic community. Among the issues discussed during the visit were: easing of regional tensions; the spread of extremist violence internationally; human rights; and the Syrian crisis. The Elders welcomed and supported the progress being made in the international negotiations over Iran’s nuclear programme. The Elders were encouraged by their visit and will now consider their next steps and hope to continue their work to strengthen regional cooperation and an easing of tensions.